It’s hard to have missed the amazing news about Pluto. The New Horizons probe has completed its flyby and sent back the above extraordinary image. 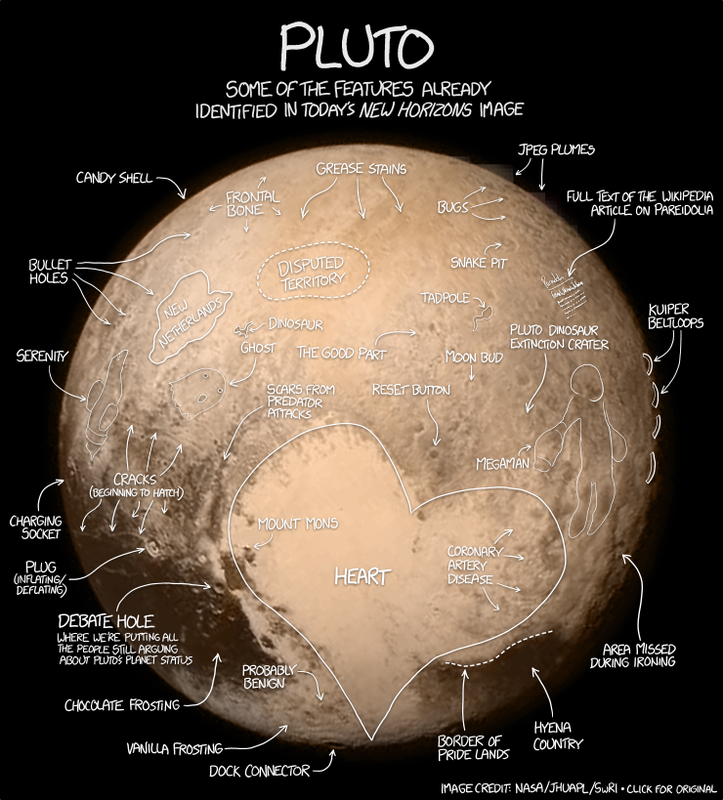 Well, minus the few additions that xkcd have added to it! The enormous heart immediately stands out, but the tadpole and Megaman are more hidden, and the dinosaur is very easy to miss when you first glance at it as well. I’m sure many more astounding images of Pluto will appear in the coming few days. Onwards! This entry was posted in News, Science and tagged APL, BBC, dinosaur, heart, Megaman, NASA, New Horizons, planet, Pluto, probe, space, SwRI, tadpole, The Guardian, xkcd. Bookmark the permalink.